Training deep learning models with vast amounts of data is necessary to achieve accurate results. Data in the wild, or even prepared data sets, is usually not in the form that can be directly fed into neural network. This is where NVIDIA DALI data preprocessing comes into play. Addressing the above issues requires your training pipeline provide extensive data preprocessing capabilities, such as loading, decoding, decompression, data augmentation, format conversion, and resizing. You may have used the native implementation in existing machine learning frameworks, such as Tensorflow, Pytorch, MXnet, and others, for these pre-processing steps. However, this creates portability issues due to use of framework-specific data format, set of available transformations, and their implementations. Training in a truly portable fashion needs augmentations and portability in the data pipeline. Data preprocessing for deep learning workloads has garnered little attention until recently, eclipsed by the tremendous computational resources required for training complex models. As such, preprocessing tasks typically ran on the CPU due to simplicity, flexibility, and availability of libraries such as OpenCV or Pillow. Recent advances in GPU architectures introduced in the NVIDIA Volta and Turing architectures, have significantly increased GPU throughput in deep learning tasks. In particular, half-precision arithmetic and Tensor Cores accelerate certain types of FP16 matrix calculations useful for training DNNs. 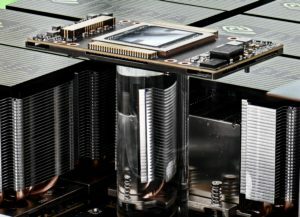 Dense multi-GPU systems like NVIDIA’s DGX-1 and DGX-2 train a model much faster than data can be provided by the processing framework, leaving the GPUs starved for data. Today’s DL applications include complex, multi-stage data processing pipelines consisting of many serial operations. To rely on the CPU to handle these pipelines limits your performance and scalability. NVIDIA Data Loading Library (DALI) is a result of our efforts find a scalable and portable solution to the data pipeline issues mentioned above. DALI is a set of highly optimized building blocks plus an execution engine to accelerate input data pre-processing for deep learning applications, as diagrammed in figure 1. DALI provides performance and flexibility for accelerating different data pipelines. DALI currently supports computer vision tasks such as image classification, recognition and object detection. It also supports H.264 and HVEC decoding for video data. Additional features, such as medical volumetric data and inference pre and post processing may be supported in future versions. Since new networks and augmentations appear every day, DALI’s plugin manager provides an easy way to extend existing functionality. Custom operators can be implemented, compiled, and loaded separately into the DALI. DALI provides portability of entire pipelines between different DL frameworks, as shown in figure 2. Range of reader operators allow using data containers unsupported natively by chosen DL framework. For example, you can use the LMDB data set in the MXNet or TensorFlow based networks. Lastly, since DALI is open-source, you will be able to readily customize and adapt it to suit the data pre-processing needs for a variety of training pipelines. Let us now deep dive into the inner working of DALI, followed by how to use it. Although DALI is developed mostly with GPUs in mind, it also provides a variety of CPU-operator variants. This enables utilizing available CPU cycles for use cases where the CPU/GPU ratio is high or network traffic completely consumes available GPU cycles. You should experiment with CPU/GPU operator placement to find the sweet spot. For the performance reasons, DALI only transfers data from CPU->Mixed->GPU as shown in figure 3. Existing frameworks offer prefetching, which calculates necessary data fetches before they’re needed. DALI prefetches transparently, providing the ability to define prefetch queue length flexibly during pipeline construction, as shown in figure 4. This makes it straightforward to hide high variation in the batch-to-batch processing time. As mentioned above, DALI follows a graph-based execution model. The following example shows you how to define, build, and run simple pipeline using the Python API. The central feature of the DALI Python API is the Pipeline class. You need to create your own subclass of Pipeline by instantiating desired operators and define the connections between them. __init__: Choose the operators (you can find them in nvidia.dali.ops module). This simple pipeline uses only two operators, FileReader to read files from the drive and HostDecoder to decode images to RGB format. You also need to pass the following parameters to super: batch size (Pipeline handles batching data for you), number of worker threads you wish to use, and ID of the GPU device employed for the job. define_graph: Define computation execution by connecting operators together. Obtain images as jpegs with corresponding labels from FileReader, pass to decoder, and return decoded data with labels as output from the pipeline. The next step is to create the SimplePipeline object and build it to actually construct a graph of operations. By this point, the pipeline is ready to use. You can obtain batch of data by calling the run method. Figure 5 shows some examples of what occurs when applying these operations. You can look at the Getting started example for more information. Seamless interoperability with different deep learning frameworks represents one of the best features of DALI. For example, if you wish to use your pipeline with PyTorch model, you can easily do so by wrapping it with the DALIClassificationIterator. During training, you can enumerate over train_loader and feed your model with data. If you need something more generic (such as more outputs), DALIGenericIterator has you covered. For more information and examples with other frameworks (MXNet and Tensorflow), take a look at the Framework integration section of DALI docs. The last thing we introduce to SimplePipeline is using the GPU to perform augmentations. DALI makes this transition as smooth as possible. The only thing that changes in __init__ method is creation of the rotate op. In define_graph, you need to make sure, that inputs to rotate reside on the GPU rather than the CPU. That’s it. With those changes, SimplePipeline performs the rotations on the GPU. Keep in mind that resulting images are also allocated in the GPU memory, which is generally not a problem since you probably end up copying them to GPU memory anyway. If not, after running pipeline, you can call asCPU on the images object to copy them back. For more information on how to use DALI with GPU, take a look at our augmentation gallery example. We prepared numerous examples and tutorials on using DALI in different contexts. For instance, if you would like to know how it can be integrated into proper model training, the ResNet50 training script in DALI docs shows this. 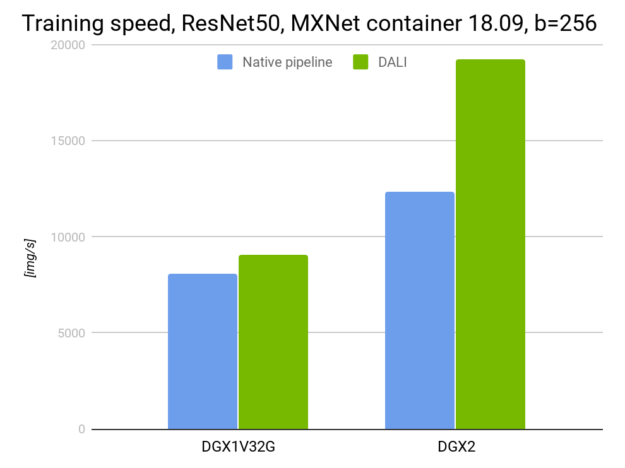 The documentation covers every step you need to take to use DALI in training ResNet50 on ImageNet. It also shows you how to spread training among multiple GPUs when using DALI. Another example shows you how to read data in a format unsupported by DALI by implementing a custom input with ExternalSource operator. NVIDIA showcases DALI in our implementations of SSD and ResNet-50 since it was one of the contributing factors in MLPerf benchmark success. Figure 6. Note how the core/GPU ratio becomes smaller (DGX1V has 5 CPU cores per GPU, while DGX2 only 3) the performance improvement gets better. You can download the latest version of prebuilt and tested DALI pip packages. The NVIDIA GPU Cloud (NGC) Containers for Tensorflow, Pytorch and MXNet have DALI integrated. You can review the many examples and read the latest release notes for a detailed list of new features and enhancements. See how DALI can help you accelerate data pre-processing for your deep learning applications. The source code is available on GitHub. We welcome your feedback and code contributions. If you are interested in learning more about DALI, listen to our talk from GTC 2018. Joaquin Anton Guirao is a Senior Software Engineer on the Deep Learning Frameworks team at NVIDIA, focusing on NVIDIA DALI. Krzysztof Łęcki is a Software Developer Engineer at NVIDIA working on DALI. Previously his work focused on writing highly optimized computer vision and image processing code for mobile SIMD architectures like NEON and DSPs. Janusz Lisiecki is a deep learning manager at NVIDIA working on fast data pipelines. His past experience spans from embedded systems for mass consumer market to high performance hardware-software data processing solutions. Serge Panev is a Software Engineer on the Deep Learning Frameworks team at NVIDIA, focusing on NVIDIA DALI. He holds a MSc in Computer Science from the French school EPITA.